If you thought your phone was amazing, wait till your TV does the same things and more. The Samsung TV “apps store” will be the first application store for high definition TVs. Scroll through the apps list on your screen to find a game you want to play. Or choose an app that lets you transfer the Netflix movie you’ve been watching to your cell phone, right where you left off. Then look at your photo album or send a tweet from your TV. We’ve been trying out one of the first games that will be available from the Samsung TV apps store. 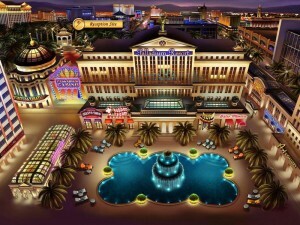 It’s “Dream Day Wedding, Viva Las Vegas,” and may be familiar to fans of “hidden object” games. These are a sort of “where’s Waldo” for children and adults. Instead of finding Waldo, you’re a off to plan the perfect wedding. To try this game on your PC, go to iplay.com or gamefools.com. You can already get Samsung “Internet@TV” on 2009 models, which bring Internet news, weather and stock information to TVs. For the 2010 TVs, content will come from Accuweather, The Associated Press, Blockbuster, Fashion TV, Netflix, Picasa, Pandora, Rovi, Travel Channel, Twitter, USA TODAY, and Vudu and others. Many new apps will be added in later months.